Sekiro: Shadows Die Twice so far seems to be living up to its hype as the latest from title from Dark Souls director Hidetaka Miyazaki. Scores are good, Steam player numbers are substantial, and the latest report on UK retail sales put the game at the top spot for the week. The sales breakdown across platforms suggests dismal performance on PC – but it looks like this is just another reminder that retail isn’t the place for computer games anymore. From Software’s latest just barely sold more The Division 2 this week, claiming the top spot by fewer than 800 copies, as GamesIndustry.biz reports. 80% of those sales were on PS4, 20% on Xbox One, and around 1% on PC. Again, these are physical retail numbers – and if the player counts reported on Steam Charts are anything to go by, the game’s having no trouble on PC. Maybe the more interesting comparisons come through From’s previous games. Sekiro sold around half the copies Dark Souls 3 did, and sales were even down 30% from Bloodborne – which was a PS4 exclusive. You can attribute a big chunk of the difference in both cases to the change in the retail market over the past handful of years. We’re only three months into the year, and Sekiro is already the seventh game to top the UK charts, after New Super Mario Bros. U Deluxe, Resident Evil 2, Kingdom Hearts III, Far Cry New Dawn, Anthem, Devil May Cry V, and The Division 2. So we’ve already got a solid variety of hits this year. 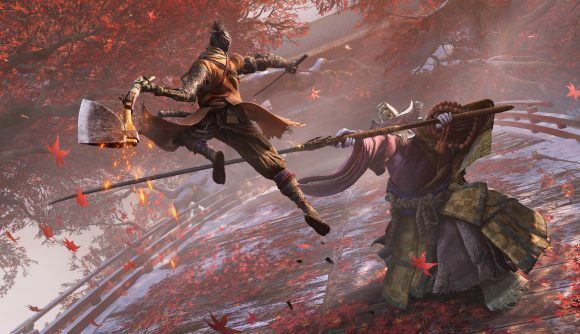 Our Sekiro review is still in progress, but the word is generally that it’s fabulous – though that save corruption bug has admittedly taken off a bit of the shine. Bugs aside, From and Miyazaki appear to have another hit on their hands.